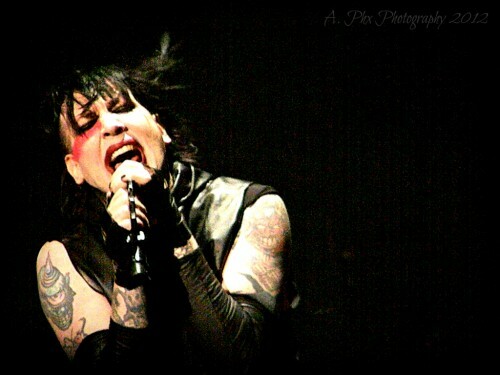 Goth-rock superstars Marilyn Manson played a sold-out show at The Fillmore in Silver Spring on Tuesday night, in the middle of their “Hey, Cruel World” tour. When I got a ticket to this show I did so without many expectations, except maybe to have a trip back in time to my high school/early college days when I was a big fan and saw them several times. I got what I wanted, basically. Their set was musically strong- Manson himself still has energy, stage presence and rockstar mojo to spare, and thankfully Twiggy (sometimes bassist, now guitarist, and major songwriter for the band) has rejoined the group after a hiatus in the early 2000s (which involved stints with A Perfect Circle, Nine Inch Nails, and The Dessert Sessions). However, having seen them in the height of their fame, while they were riding high on the shock-rock infamy which used to surround them, Tuesday night’s show seemed like mainly old tricks. It was also shorter than one would expect (15 songs, just over an hour-long set) from a band who has been around and active for as long as they have, with as large a catalog as they have. 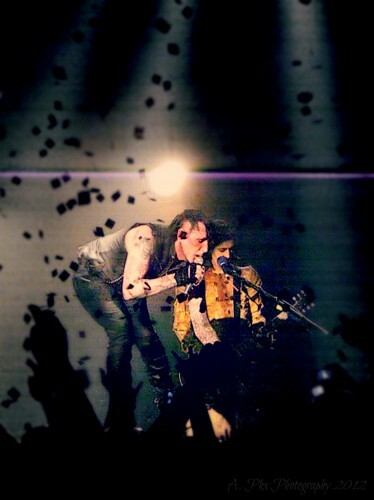 The band started their set off with a dramatic flair- a smoke-filled stage, and a curtain drop to reveal the band, as they launched into “Hey, Cruel World…” the opening track of their latest album, Born Villain. The crowd immediately burst into a boil, arms flying, crowdsurfers launching. 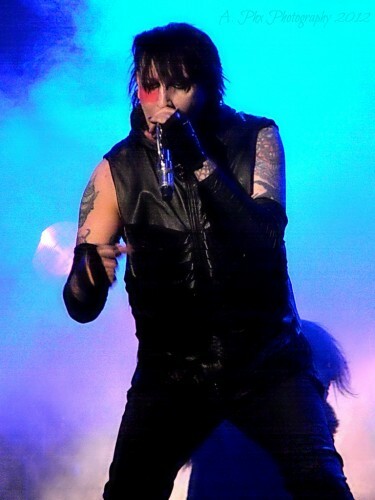 Manson also came through with a few costume changes throughout the set- a sequinned dinner jacket for “Dope Show,” and later an amusingly glam disco-ball motorcycle helmet. 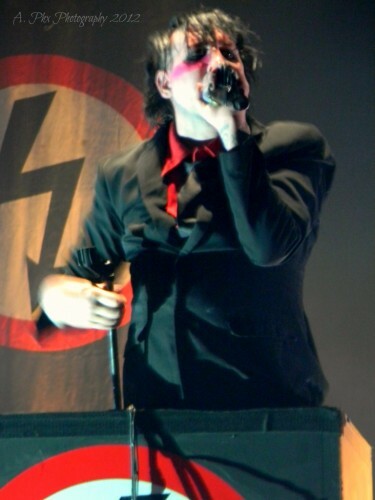 But after seeing him on the Antichrist Superstar tour crawling on four stilts, or in a barely there gauze corset get-up, these seemed somehow tame. 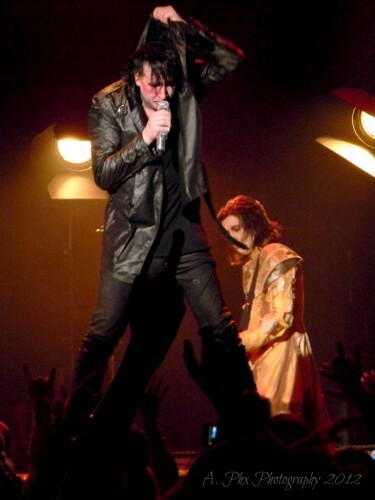 The most shocking thing Manson did all night was put his hands down his pants…twice. And that just read more pervy than shock-rocker. Also, I swear he said “I wrote this song in rehab” before launching into Depeche Mode’s “Personal Jesus,” the first of two covers in the 15-song set. The crowd clearly ate up everything that Manson served, though. 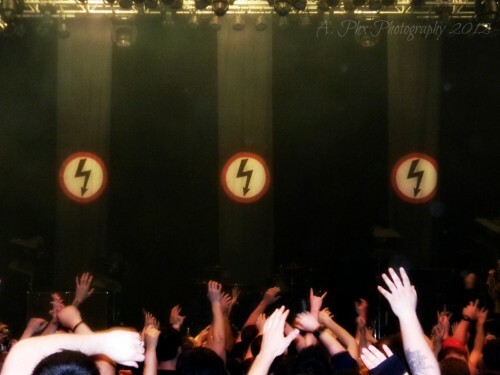 Highlights of the set, for me, were from the older material- the slow burning “Tourniquet,” supercharged speedcore “Irresponsible Hate Anthem,” and the anthemic, pounding “Antichrist Superstar” (which featured Manson on a podium, an impressive visual, but one recycled from the Antichrist Superstar tour). They ended the set with hypnotic “The Beautiful People” which drove the crowd wild, but the end of the set felt premature…the crowd wanted and deserved more. Alexia was born and raised in Arlington, VA. She has been a cellist since age four, and a lover of rock & roll soon after. The first tape she owned was “Make It Big” by Wham, and the first tape she bought was Nirvana’s “Nevermind,” and she still loves both. She was a member of local synth-rock outfit Soft Complex for several years, and has recorded with bands including Engine Down and Two if By Sea. By day she works for a non-profit distributing royalties to musicians and labels. She currently plays cello, lap-steel guitar and tambourine in the DC post-folk/Americana band The Torches.